Look very closely. Can you see it yet? Having some trouble figuring it out? Here is a hint: The person on the left will soon be inside the magazine on the right. Ohmygosh, you’re becoming a fashion model?! you are probably asking yourself. No, no I am not. But thanks for thinking that. I’m flattered. 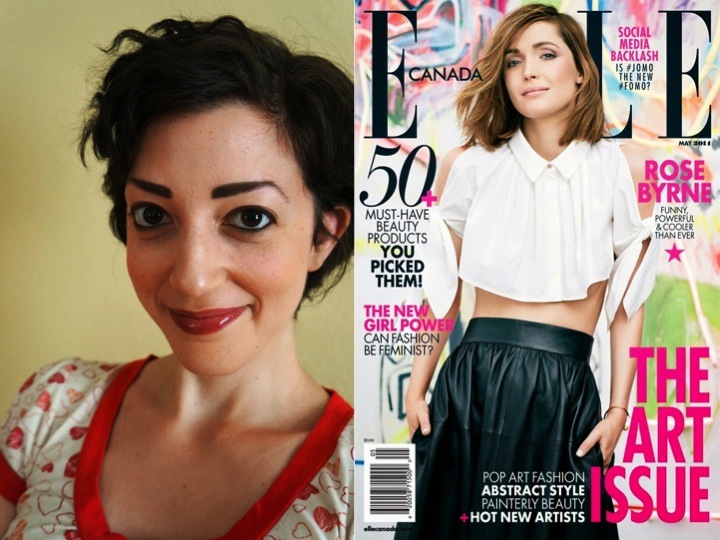 I will, however, be joining the wonderful Elle Canada magazine as a columnist, where I will be penning my own monthly column for one year. This is something I’ve known about and have been working on for awhile but I’ve had to keep it a bit of a secret, because if I spoil everything, then no one will want to read about it months later when it’s published… alas, I have been living under a shroud of secrecy. But now you know, and I’m excited to share this new development with the world. I am so grateful to Elle’s amazing editor-in-chief for taking a chance on me and giving me this opportunity. I’m sure “national magazine columnist” was probably on my list of dream future scenarios for myself, back when I was a little girl. I started this blog as a simple diary, a way that I could chronicle my journey through the unthinkable. And now it has become this force that continues to open so many new doors for me. I’m sure there is some sort of life lesson takeaway from that, but I don’t feel like exploring whatever that may be right now. All’s I know is I’m pretty excited to flip open that first issue and see words that I wrote, attached to my name, smack dab in the middle of perfume ads and celebrity interviews. The first issue is September and will be on stands soon (I wasn’t paid to say that, I swear). If you’re Canadian, you should be able to easily spot it (or you could just subscribe, which costs next to nothing). And if you’re not Canadian, there should be plenty online to keep you entertained. I don’t have a link or a spoiler or a preview to share. All I will say is the column will be about me and this next phase of my life. I will be doing lots of cool and fun things and living my life the best that I can, and writing about it as I do. I hope you’ll come along for the ride. It should be a good one. Steph, what a wonderful opportunity for you at an excellent magazine! You’ll be great! I will check the newsstands—it must be out any day now. Congratulations. Hmmm, I wonder what you would be doing if you hadn’t had the experience of cancer. None of us want it but it sure does open doors of opportunity. Can’t wait to read your fancy, shmancy column in September. You go girl!! Believe me, I think about that ALL the time.. in fact, I think I will write about that soon! Just stumbled across your blog, and glad I did. This is such a cool opportunity!!! Love hearing stories like this. How wonderful, congrats!! Enjoy the experience, I’m sure your column will be great! What terrific news! Please make sure that your columns are available south of the border (at least in Massachusetts). Congratulations!!! Congrats! Sounds like a great fit for you. Your writing is great. I have already subscribed ! Looking forward to the first issue. New subscriber here for sure! His wishes seem to come true. Let them! Brazilian hug. Wow! Congrats Steph!!! You’ll be great. I will definitely pick up a copy over the next few weeks.